Featuring an unmatched combination of warmth, lightweight packability and protection that’s crucial for alpine pursuits like climbing, skiing and trekking, the Hyperia Lite Hybrid Jacket offers technical performance with natural merino insulation. The Hyperia’s ultralight yet durable Pertex® Quantum Air face fabric features a DWR finish that sheds variable conditions. Inside, they used Icebreaker's innovative 100g MerinoLOFT™ insulation, a sustainable and high-lofting alternative to synthetic fills that retains warmth even when wet. The Hyperia also features merino-blend stretch side panels to regulate body temperature, improve range of motion and keep you comfortable everywhere from local rock climbs to backcountry hut trips. Zippered hand pockets and an internal zip pocket store small essentials, offset shoulder seams eliminate chafing when you’re moving with a pack and the jacket stows in its internal pocket for premium packability. Hyperia Lite Hybrid LS Zip- Mens is rated 4.4 out of 5 by 7. Rated 5 out of 5 by BRAVEHEART from Winter Marathon Training I’m 73 yrs old and do power walking to keep me fit and weight watch, I’ve done various races 5 - 10-15 20- 4 1/2 marathons and full marathon last year and training for full marathon in May.Have been training since Jan, and needed something I could pack in my hydration vest and still be fairly comfortable with other layers in Alberta winters -20 and below. This is my go to jacket and just love it, highly visible and easy packs down when I need to. Have other Icebreaker products which I love and use in the winter. A bit costly but well worth when you get a few seasons from them. Rated 4 out of 5 by Gvsskier from -30 Celsius and an excellent mid-layer The jacket fits long and a bit roomy in the mid-section. The long is very nice for lower back. The roomy is a bit loose for athletic fit. I bought a large and I’m 6’1” 195lbs with an athletic build. Rated 5 out of 5 by CanadianPrairieGuy from What I envisioned This is a real nice jacket. It is super light and not bulky thus allowing full range of motion. Warm enough even for our late fall/early prairie winters. The XL works perfect for me and the sleeve length is right on. Only thing I would like to see enhanced is a velcro strap around the wrists to provide an option to make a tighter seal. Rated 5 out of 5 by MV66 from Fantastic jacket ! Excellent quality! Great looking garment!! Very warm and great for layering!!! Rated 5 out of 5 by MrJohnnyFreedom from Great for travel between hot and cold zones Love my newMerinoLOFT™ Hyperia Lite Hybrid Jacket. I bought it to train outdoors in the winter but used it to travel between Canada (-20 degrees) and Mexico (+30). easy to pack when i did not need it and warm enough in transit from home to airport. love it so far. will put it to test on some winter runs this week. The fit is good, I followed the suggested size guide and got a small even though I usually get medium size in other brands. 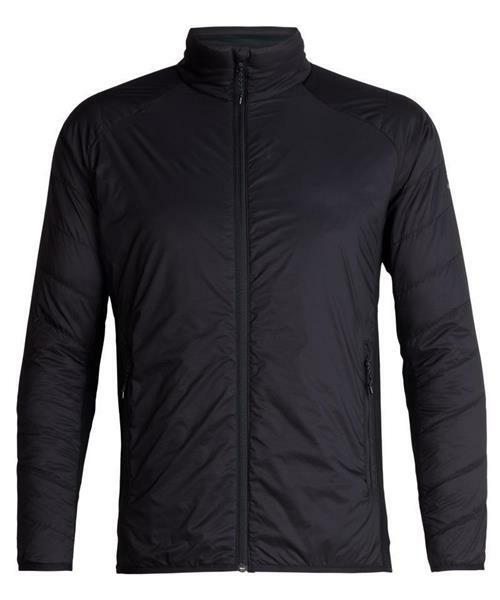 Rated 3 out of 5 by MrJohnnyFreedom from Not ideal forrunning (MerinoLOFT™ Hyperia Lite Hyb In this second review, I have now had a chance to train with the jacket in -5 to -8 degree (not including wind chill factor) weather. It is wind proof and light but did not breath enough and got really soaked. Only wore one long sleeve merino GT underneath. Still love the jacket. Will need something else to train on cold weather. Rated 4 out of 5 by LucB514 from Light and Comfertable Great jacket for traveling. As mentioned by another reviewer, this is perfect for fall/beginning of winter in Canada. Wore it down to -8 C on a windy day; that was pushing it a bit. Use it as a mid layer beyond -5, mostly due to the fabric band along the sleeves of the jacket. Expensive but it looks well made.